When Jimmy Hawkins enlists and is shipped off to fight in World War One, his new bride Ruby is forced to find herself a job in order to get by without him. The daughter of a cloth merchant, Ruby is skilled in the art of running a business and keeping books, but as a woman in the early 20th Century, these are not acceptable talents for a young lady. Even Ruby herself doubts her own abilities, when she gets a job at Curry and Sons timber merchants as a book-keeper. The men in the office there are suspicious of her and feel she is taking a man's job, but there aren't any men around looking for work, and as it is, half the company has enlisted, including Mr Curry's son Laurie. When Ruby and her employer discover that her husband and his son are in the same company over in Turkey, a strange and reluctant family is formed. This was an interesting book, in that it turned out to be far more complex than I ever expected. There is a rapidly growing genre in Australian historical fiction that prioritises sweeping love stories that subvert class and age, and I had half-expected this to be one of those. 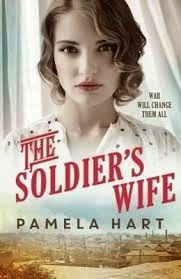 Yet The Soldier's Wife was a far deeper sort of story, and one with an extremely positive message. It is a widely accepted fact that the shortages of male workers during the wars pushed women into all sorts of jobs that they had previously been excluded from, but rarely is this dealt with in commercial fiction. The central love story of The Soldier's Wife is not between Jimmy and Ruby, but between Ruby and herself, as she learns how capable she is, and becomes the sole provider for her little family. I particularly related to Ruby's story later on in the book, when she began to run Curry and Sons from behind the scenes after a tragedy. Hart's writing really captured that feeling of being on a trapeze without a safety net that accompanies having to take responsibility for someone else's livelihood,which is a situation I have occasionally found myself in. Ruby must use her common sense and initiative, but she also must rely on her friends to get by, and this element of the story is heart-warming, and makes Ruby rather likeable, despite the hardnosed approach she has to take at other times of the book. Hart also addresses the issue of what it was like for men to come home to working women, when Jimmy comes home injured and has to face the reality that Ruby is now the provider and not him. Jimmy has lasting psychological issues due to trauma, but he is also resentful that his place as the Man has been taken by his woman. Ruby is saddened by the loss of her gentle and passionate husband, but her love for Jimmy is still strong and she must find a way to keep them both happy as well as comfortable, in terms of having enough money to live on. While I found myself frustrated by Ruby's tolerance of Jimmy's bad behaviour, I had to remind myself that I was reading about a different era-- in the post world war one days, divorce was NOT easy and also not socially acceptable. For Ruby, it would have been a big decision to face. The fact of her husband being injured and traumatised by war also would have been a factor in her decision, and I cannot imagine how hard it would have been to first live without him and fear for him, and then have him home and different. This is a situation evoked well by the book. As far as the historical detail goes, the book is gentle in its approach, and while there are no anachronisms, the story took pride of place. It could be said that this was a historical novel that lacked the typical nostalgia that usually drips all over this genre, and possibly this was a good thing. For me, as a history nerd, I somewhat expected the details to be a little more in the forefront. But overall, this was an enjoyable novel, and Hart is obviously a skilled writer. This book would make a great Mother's Day present, if you're looking for a recommendation. I like the sound of it, lovely review!